Essentra Security exhibit at global security show in London. Security Document World is a global event and platform for innovative solutions in citizen and government ID. 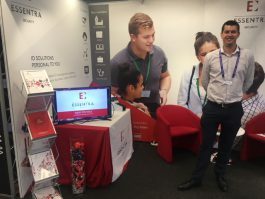 Held at the QEII Centre in London, the conference and exhibition showcased the best in intrinsic document security and new cutting-edge secure infrastructure. In partnership with Magicard, our ID experts were on-hand to demonstrate the RioPro 360 secure which provides added security to the standard printer model. Depending on the application, the RP360 can accommodate different complexities of holographic printing. For high-security projects, combining overlay laminate with a tactile impression is recommended. The impression stamp which is a print feature of the Datacard 460 helps to prevent counterfeiting and strengthen brand image. For more information on our ID cards, speak to one of our specialists via email or on 0208 266 3300. After a successful show this year, we look forward to seeing what’s next at SDW19.